After receiving a masters degree in biochemistry from York University, Judy focussed a lifelong interest in physical and learning disorders and children by working at the public school in Spirit River. She also taught various forms of dance in her home for twenty six years. Judy is greatly enjoying her early retirement from her official jobs, but continues to work with children through tutoring and art classes. She also volunteers at long term care facilities, thrilling seniors with watercolour lessons. 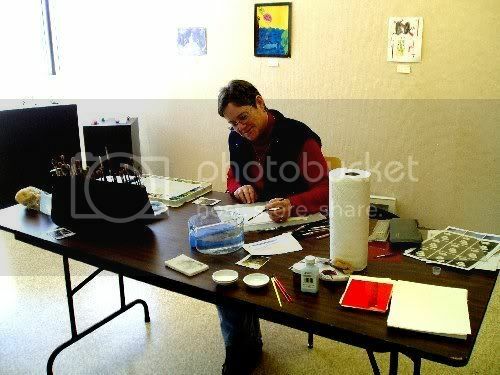 Judy is the driving force behind the annual library art show and sale fundraiser in Spirit River. Judy began painting in the early 80s and soon chose watercolour as her main medium. She has shown and taught all over the Peace Country for many years. She has taken art courses from Jack Reid, Jake Mohl, Romain Teisenhausen, Bob Guest, Jim Adrain, and Dean Reeves. Judy's favourite subjects to paint are water and snow. She is also fascinated by the delicate translucence of prairie skies. Judy preparing for an art class in Fairview.